Do loud motorcycles prevent accidents? In my neighbourhood, there is one of these inconsiderate people who has a loud motorcycle. I've already told him that his motorbike wakes me up, and he politely apologizes, but then does nothing about it. I was looking online for options about what to do about this situation, and I came across a lot of heated debate. In that debate, I saw basically two arguments in defense of loud motorcycles. One was, "no one should ever tell me what I can and can't do," and the other was, essentially, "motorcycles have to be extra loud so that people in cars take more notice of them, so it's a safety issue." For example, this article, and various posts in this Reddit discussion make the safety claim. Is there any concrete evidence at all to support the claim that a loud motorcycle gets noticed in traffic in any way that makes it safer than a quieter bike? Are there any studies that show the opposite or that there is no statistical difference in safety between bikes of different volumes? As a rider myself I'm sure there's a lot of different opinions but let me answer a few points here. "motorcycles have to be extra loud so that people in cars take more notice of them"
Is not true. If anything, manufacturers try to make bikes quieter, more fuel efficient and more eco-friendly. For example, Harley Davison, a company know for gas-guzzling, loud motorcycles has been working on an electric bike for quite a few years now with next to no sound, mere inaudible for someone driving a car. 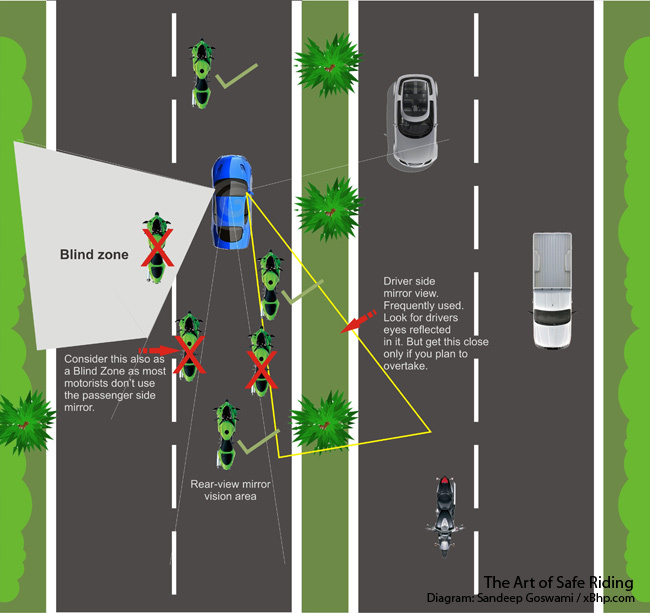 The argument alone about sound is irrelevant as when learning to drive you're taught that bikes are a hazard in your blind spot (see diagram). I dug around various automotive sites and found this article (meta below), which may not be a scientific study as sorts but covers your question moderately well and gives a general consensus. This myth is originated in the very biking world and is has a lot of supporters among both riders and custom aftermarket exhaust pipes manufacturers. Basically, those who claim that loud pipes save lives assume that the louder the noise a motorcycle makes on the road, the more chances they have of being noticed by other road-colleagues and thus less likely the occurrence of an accident. The truth behind such a claim disproves this myth on so many levels: simple, common physics, common sense or plain reason can bring in countless reasons because this is just a myth. Let's tread the path of physics a bit and analyze what's happening from a strictly mechanical point of view. Motorcycle exhausts openings are facing towards the rear of the bike, and it's obviously to the back where the gases and all the noise are directed. Assuming that the noise a motorcycle makes travels in an omnidirectional manner is just wrong, because noise is air (or other gases, for what's worth) in movement. With the air/ gas jest directed towards the rear of the bike, it's there where all the noise goes. And if you don't believe this, just 'start your engine in the open and then check the noise levels when facing the bike and behind it, alternatively. When riding at higher speeds, things are even worse, because you're not only remaining close to the place where all the exhaust gases start to make noise hitting the mass of air, but you're traveling further from that zone as you advance on the road. Aftermarket exhausts can also be almost as silent as stock ones. A loud vest or jacket can help others see you better. High-visibility helmets are good if you want to be seen on the road. Now, having established that pipes generate a lot more noise behind the bike than in front of it, claiming that loud(er) pipes would help getting you noticed by the man driving the car in front sounds just silly. A loud exhaust pipe could come in handy when splitting the lanes at low speed, letting the drivers in front of you know “something is approaching” and maybe preventing them from cutting you off or opening the doors. Analyzing the crash reports, statistics indicate that around 77% of the hazards come in front of the biker, and only 3% approach from behind. What's next, front-facing exhausts? Common sense urges us to think about noise pollution: while a rider might believe that the new sound of the bike is the most beautiful music in the world, many others might (and will) strongly disagree. Throttling the bike at 11PM thundering down the alley will simply increase the prejudice most non-bikers have against us, the riders. For most people, this sound is as pleasant as a dumpster truck on a Sunday at 5 AM, after returning from a party and getting one hour of sleep. Adding “it's my bike and I'll do with it as I see fit” is not helping; au contraire, it just makes a very lame excuse for making excessive noise. Owning a motorcycle does not come with the right to break the noise regulations, and even though a racing exhaust might receive clearance for installation on common bikes, this brings little comfort to the passers-by and traffic-fellows. It's just a matter of being polite and care for those around you. Not the answer you're looking for? Browse other questions tagged safety . Seat belts in cars save the lives of occupants in cars, but do they lead to lower deaths for all road users? Can surgical spirit and formaldehyde prevent blisters? Did Boeing and Douglas know about the dangers of square windows before the Comet accidents? Do green grapes cause more accidents on the London Underground than banana peels? Do defensive driving courses reduce car accidents in teenage drivers?